The new 2011 Saleen S302 made it's debut at the Carlisle Ford Nationals. The S302 is Saleen's primary entry into the 2011 Ford Mustang tuner market this year. Based on the 2011 Mustang 5.0 liter V8, you know it's going to be a lot of fun. I can't exactly say I'm blown away by the styling of the 2011 Saleen S302, but there's elements of it that I really like. The new wide scoop and hood look very agressive and the front bumper/valance work extremely well, but I'm less enthusiastic about the optiional side window scoops and lower rocker trim. The rear is better, with the blackout panel between the tail lights and some tasty rectangular chrome exhaust tips at each corner. Some nice additions to the already superb 2011 Mustang interior have been added, including special gauge treatments, a custom shifter nob and some very nice ultrasuede insert seats. These look great and the ultrasuede should help you keep planted in your seat on hard cornering exercises. You'll also find leather door inserts and some cool self illuminating Saleen Logos fitted into the custom sill plates. As you'd expect, Saleen isn't going to leave the engine and handling stock. Power in the already great new 5.0 liter V8 has been increased to 425 horsepower and delivered through a 3.73:1 rear end for good bottom end grunt. 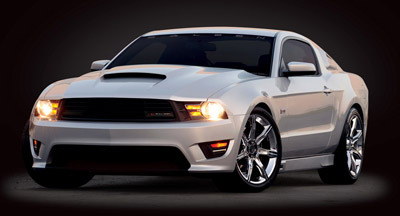 The additional power is derived from a performance exhaust system and Saleen's own performance air filter. Although not a dramatic difference in power from the stock 5.0 liter V8, Saleen seems to have a way with finding power in the right places to make these increases seem even larger. Suspension has been treated to the famous Saleen Racecraft suspension upgrades for more control and stability. Check out these cool Mustang burnouts from the Ford Nationals!